Which Roles I am playing? Learn to play your everyday "roles" more effectively and have more fun playing them! If you want to be dynamic and convincing- in your worklife as well as among friends it is extremely useful to broaden your role-playing repertoire. What does the word„Role“ mean? Our verbal language, body language and how we use our voice. Role-play differs from acting in that we are not trying to become a different character. Rather we are expressing different perspectives, different „versions“ of our own character. How does status behaviour express itself? The impressions others make on you and how they sometimes manupulate you into roles you don’t want to play. How to avoid this! How your „performances“ can become livelier and more convincing. 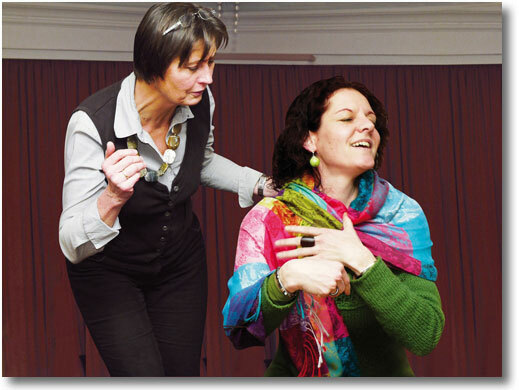 The workshop uses methods which stretch beyond their original application in theatre-Body and role-play exercises, as well as improvisational theatre. Each theoretical input is supported by exercises which illustrate and deepen the topic. There is also time for reflection, exchange of ideas and working through concrete examples.